Review sample courtesy of BigBadToyStore. It’s a testament to the enduring beauty of Hajime Katoki’s mech designs for the Virtual On franchise that Bandai is still releasing figures with Sega Dreamcasts on their backs. Katoki’s taut, colorful mecha still feel remarkably fresh. For this entry in Bandai/Katoki’s Composite Ver. Ka. 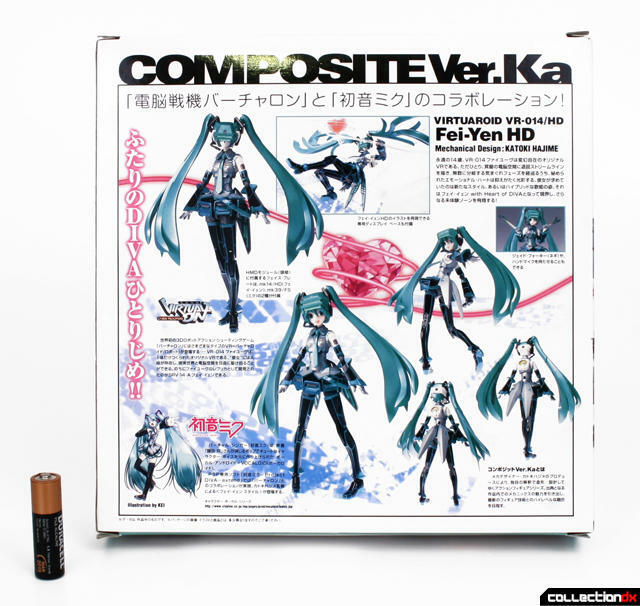 series, the designer grafts elements from VO’s Fei Yen onto Virtual Vocaloid Diva Hatsune Miku. 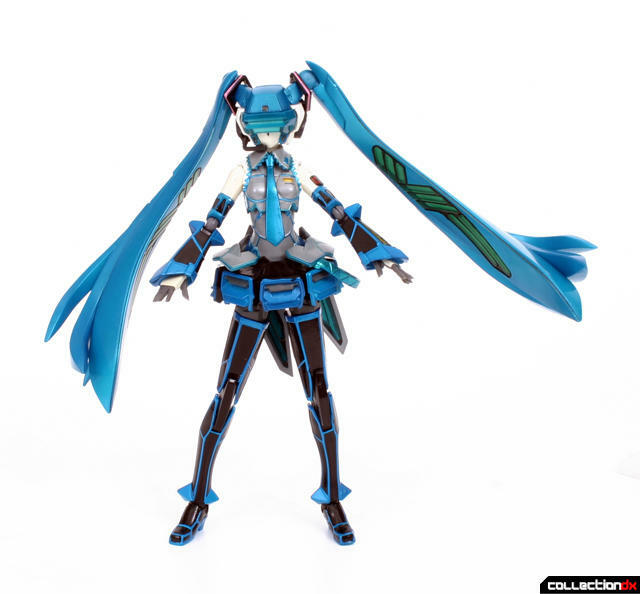 What the hell is Virtual Vocaloid Diva Hatsune Miku? Good Question. 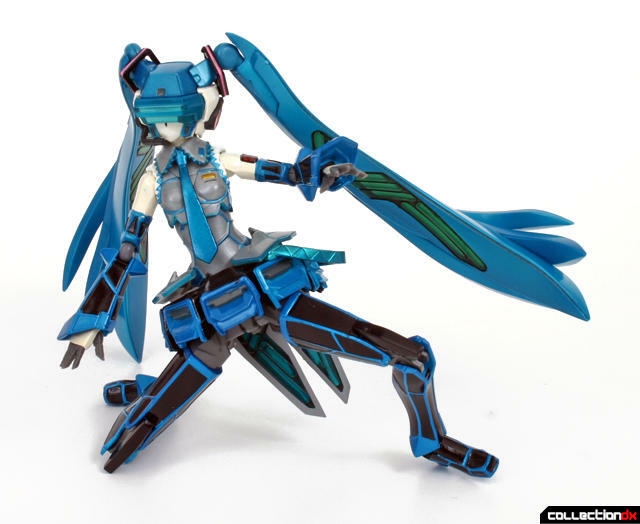 My assumption until about ten minutes before writing this review was that this design was just a variant outfit or something from some Virtual On spinoff. Not so. 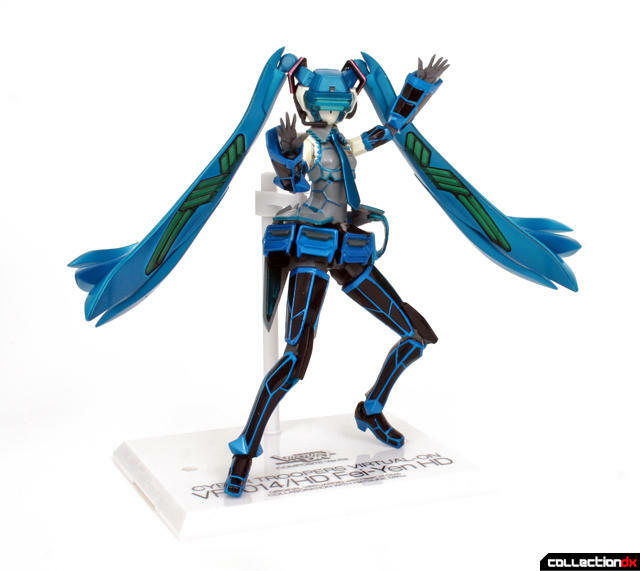 So yeah, Hastune Miku is a singing, dancing hologram pop star, which has been a thing for awhile now. 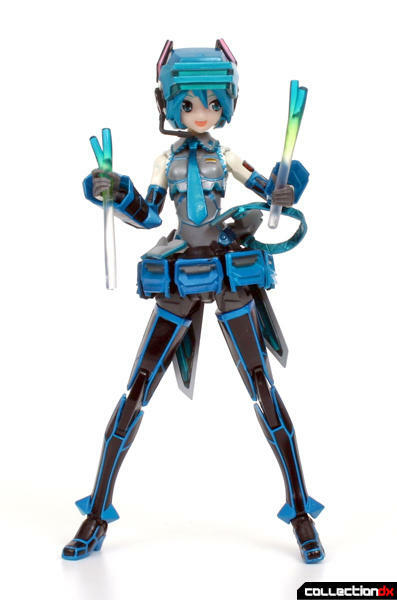 Which makes it that much cooler that Bandai has released a toy version of a virtual idol dressed up like a Virtual On character. The packaging is standard Composite Ver.Ka, a sturdy, attractive window box, but a little too vanilla for my tastes. 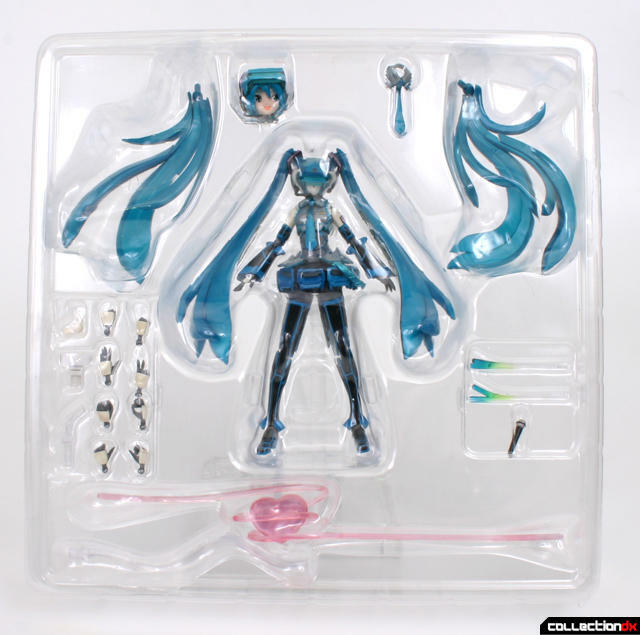 Inside, a plastic clamshell with the figure, alternate head, alternate hair, alternate hands, stand parts, a microphone (NOW that makes sense!) a couple of funky clear twig-things (called leeks? 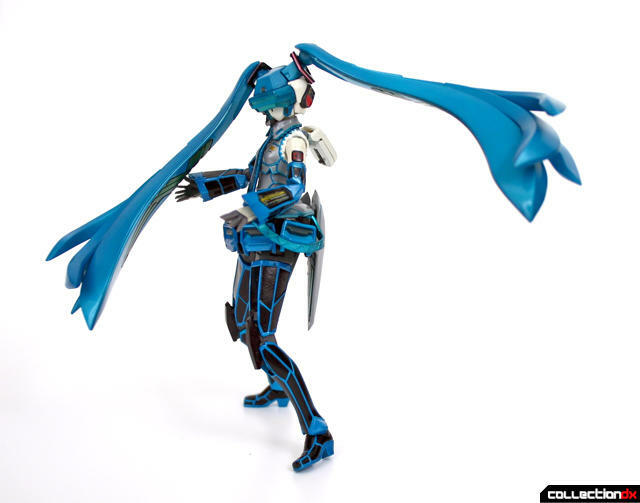 Hatsune Miku is often pictured with leeks, I guess? For some reason? ), an extra dickie identical to the one on the figure, and a floating heart. This is officially the girliest thing I own. 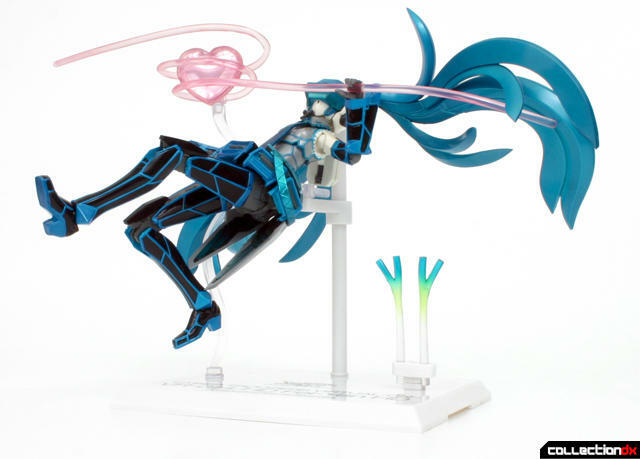 Out of the box, the figure is eye-catching. Paint applications are smudgy in some areas, but typically sharp. The piece has a very non-gokin high-end feel. The plastic (PVC?) is lightweight, but still substantial. The fit and finish are tight. I love the translucent details at the underside of her hair pieces. And here's the Sega Dreamcast, with removable disc! It’s been explained to me that CVK is an evolution of the Gundam Fix Figuration line, closer to poseable statues than proper action figures, and Fei-Yen is no exception. While there is decent articulation, it’s all very limited, although the nature of the bulky skirt may be responsible for that. The stand is absolutely necessary. She will technically stand, but only briefly and precariously. No matter, if looking good is the piece’s raison detre, it succeeds. It’s just a cool little toy. It looks badass in mecha Fei-Yen mode. 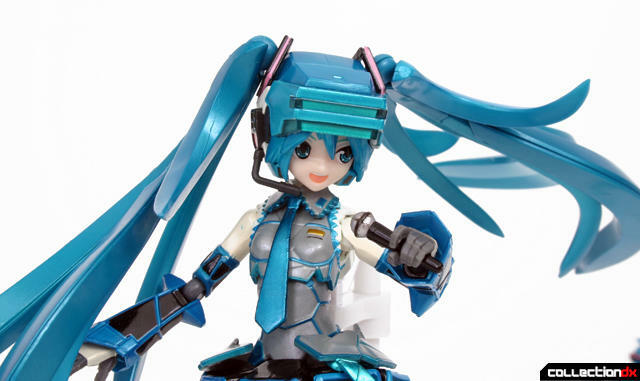 Then you can swap in the Hatsune Miku head for kawaii Vocaloid playtime. 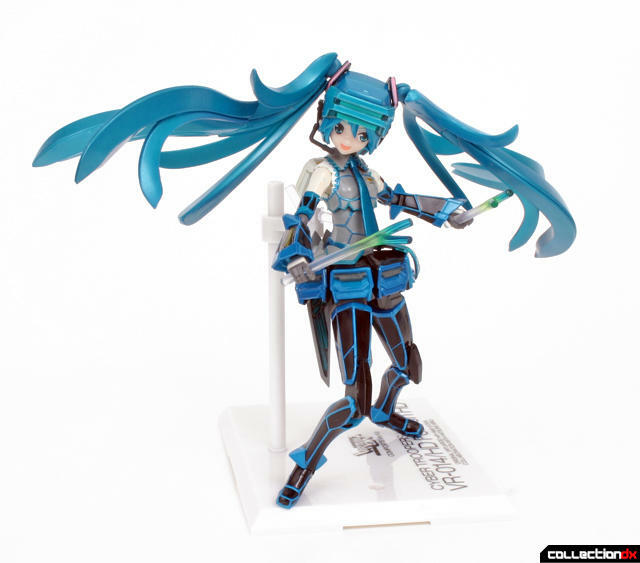 Oh look, Hatsune Miku with her trademark Leeks! And one more, for the superfans. A major element of this set is the whole ‘floating in the vicinity of a suspended heart’ diorama, which I can only reproduce with middling results. I can’t tell you how much more I like this thing now I know how strange it is. It’s a solid toy without the story, but the funkiness of the slashfic styling makes it special. So, despite being someone who is not a stranger to the Vocaloid fandom, this release still puts a really bad taste in my mouth. This is not a special variant, or a limited release. As of right now this is the release of Fei-Yan for the Composite line. 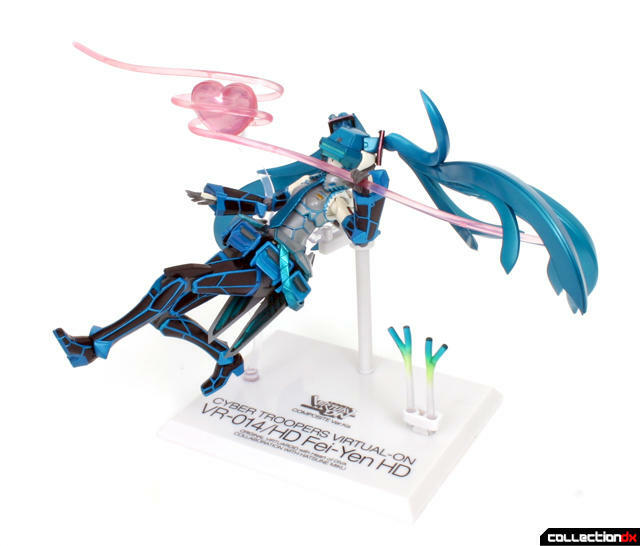 I don't have any opposition to the figure itself, but I haven't heard of any talk of releasing a proper Fei-Yan, and if I were a bigger Virtual On fan I'd be incredibly P.O'd. I find that frustrating too. I find that frustrating too. A nice pink original Fei-Yen would look great with the Temjin. 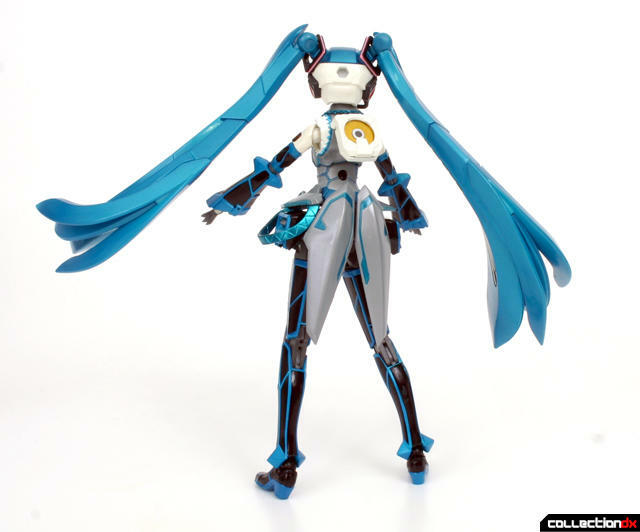 This figure is pleasing enough on the basis of its own visual aesthetics, but the idea of combining Miku with a Virtualoid just isn't cool or interesting to me. I take solace in the suspicion/dread that if they did a proper Fei-Yen, it would probably be Fei-Yen The Tiger, which I hate. 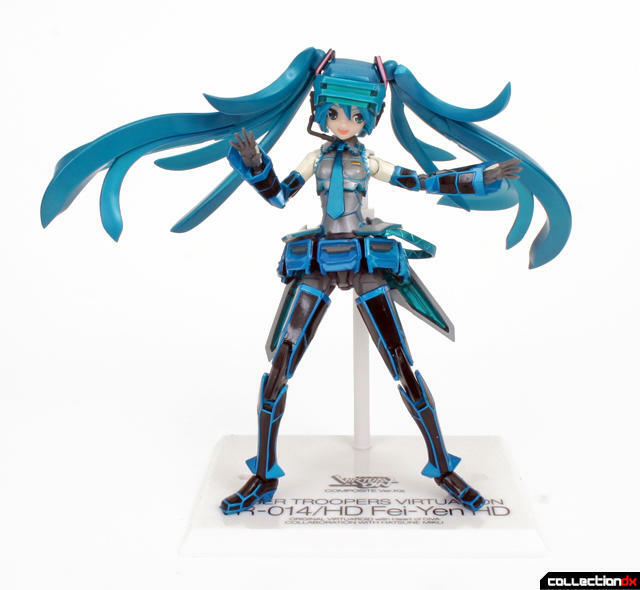 I have a similar conviction/fear with regard to Bandai producing a Composite Ver. Ka Apharmd The Hatter... and no other Apharmd variant. Haha, now that I've been replied to I can't go back and fix my pretty terrible spelling error, which I made twice, and am not entirely sure why I did. The Virtuaroids have had Sega Saturns (shiro! ), Dreamcasts, and then non-specific CD drives on their backs but never a Genesis. 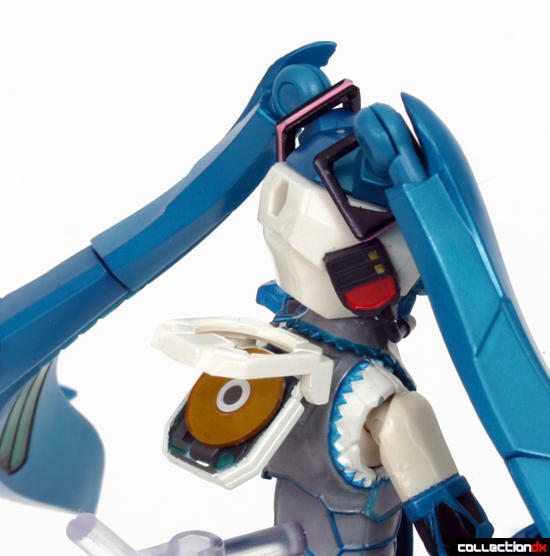 Bandai never made any Virtual On Oratorio Tangram figures. That was Kaiyodo and Kotobukiya. Get your failed Sega consoles that I still own right. 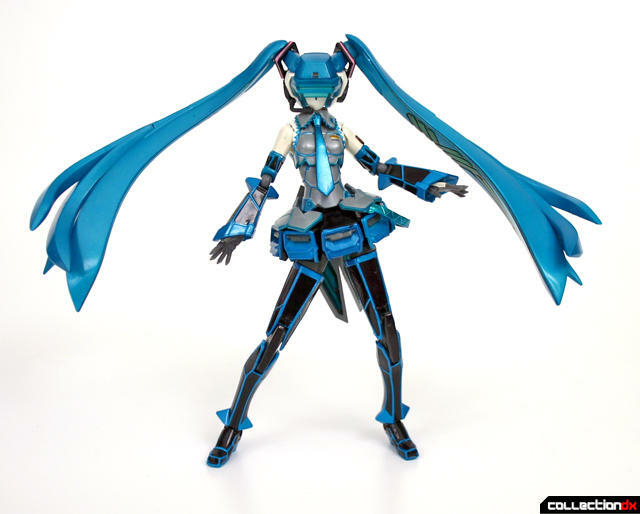 Well I'm not a big fan of Miku but I have to admit I think I prefer the blue and black color scheme to the original pink. 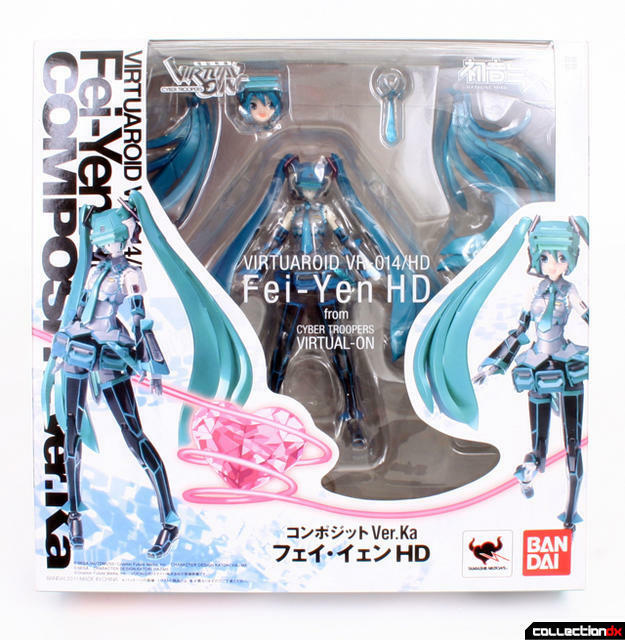 Too bad it isn't just a variant of the regular Fei Yen design instead of a vocaloid tie in. Taste in music is subjective of course but to me it sounds like somebody inhaled a bunch of helium and tried to sing a ringtone. Possibly one of the more bizarre crossovers from recent years. No crossover will ever top "Star Wars Transformers" for strangeness.